Even in this gluttonouse city, few people have the apetite for real estate that Mr. Sutton has. 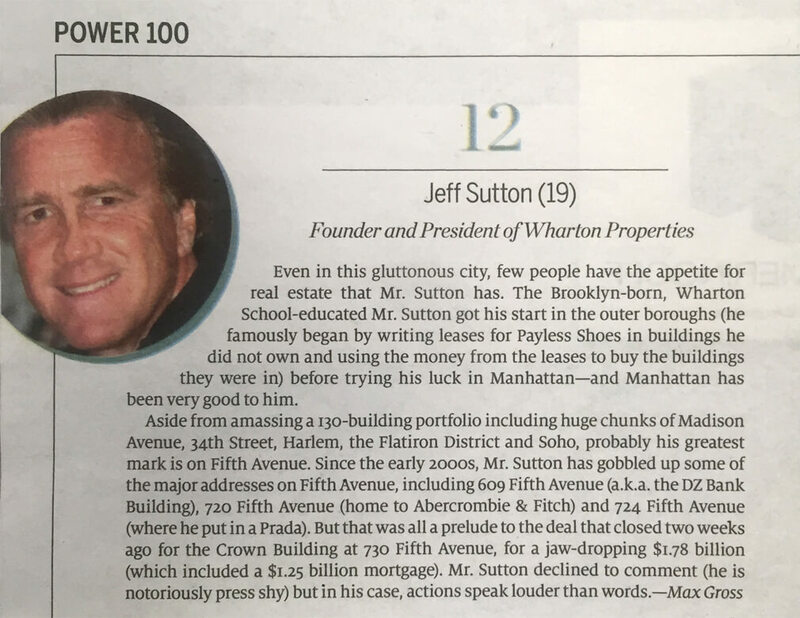 The Brooklyn-born, Wharton School-educated Mr. Sutton got his start in the outer boroughs (he famously began by writing leases for Payless Shoes in buildings he did not own and using the money from the leases to buy the buildings they were in) before trying his luck in Manhattan - and Manhattan has been very good to him. Aside from amassing a 130-building portfolio including huge chunks of Madison Avenue, 34th Street, Harlem, the Flatiron District and Soho, probably his greatest mark is on Fifth Avenue, including 609 Fifth Avenue (a.k.a. the DZ Bank Building), 720 Fifth avenue (home to Abercrombie & Fitch) and 724 Fifth Avenue (where he put in a Prada). But that was all a prelude to the deal tha tclosed two weeks ago for the Crown Building at 730 Fifth Avenue, for a jaw-dropping $1.78 billion (which included a $1.25 billion mortgage). Mr. Sutton declined to comment (he is notoriously press shy) but in this case, actions speak louder than words.